It’s 7:30 AM on Saturday and I’m in the back of a taxi speeding down the highway towards Lima following an overnight LAN flight. The sky is a hazy gray, a common occurrence as a result of the subtropical desert climate meeting the cool waters of the Pacific Ocean. As I approach the neighborhood of Miraflores, I see groups of surfers on my right, bobbing around in the ocean waiting to catch the next big wave. To my left are steep, 100-foot rocky cliffs with modern buildings perched at their summits. It’s a scene reminiscent of Southern California. In the face of the country’s booming economy, a surge in national pride and a culinary tradition taking the world by storm, one can easily forget about those left out and the poverty that lies beyond. I’m in Peru for a series of site visits, meetings and events that will have me crisscrossing the southern part of the country and visiting more than half a dozen cities over the course of the next 12 days. It’s my first time here and I’m particularly excited to see the fourth of our five country operations in action. My watch alarm goes off at 6:00 AM and despite not having my customary first cup of coffee to jolt me awake, I hit the ground running. 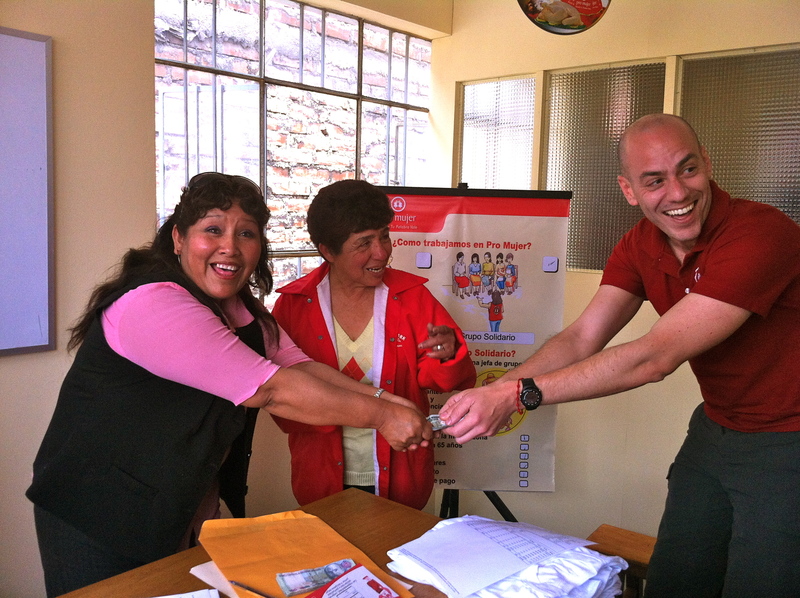 Naldi Delgado, Director of Pro Mujer in Peru, and I are teaming up to give a short presentation to a group of visitors from one of our partner organizations, Global Partnerships (GP), a non-profit social investor. 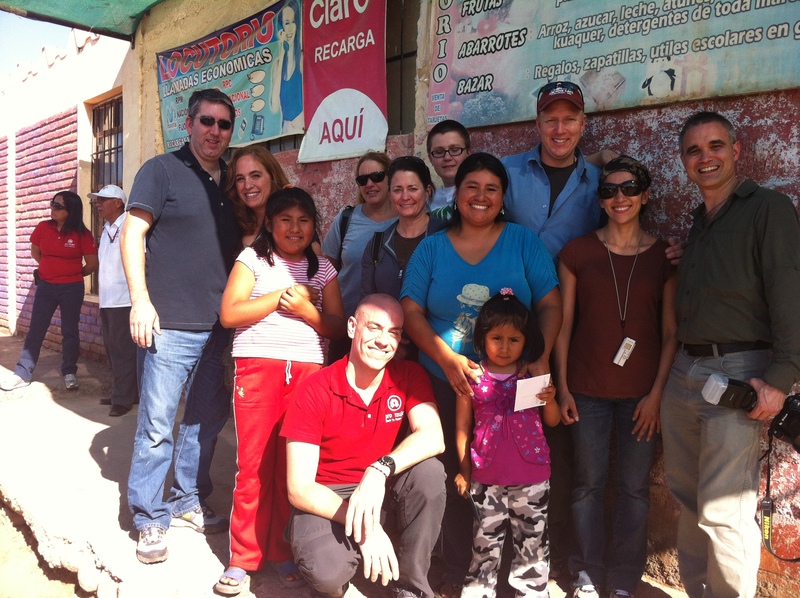 The group, headed up by Chris Megargee, GP’s Director of Community and Corporate Relations, is in Peru to see our operations first hand and meet some of the 245,000 strong, hardworking women we serve across Latin America. GP is one of the organizations – along with PATH and Linked Foundation – that partnered with us for our health pilot program in Nicaragua. This pilot seeks to tackle the increasingly-serious issue of chronic disease among our target population (hypertension, diabetes, sexual and reproductive health and cancers, specifically breast and cervical) and one that has broad implications for people worldwide. After the presentation we board a van for the hour and a half ride that will take us through the desert to the small rural town of Pedregal. Here we will have the opportunity to see our Jornadas de Salud; a series of health campaigns that consist of RVs retrofitted to suit our needs as mobile health clinics. Complementing these clinics are staging areas where additional services are provided by ophthalmologists, optometrists and obstetricians, among others, at below-market cost or free of charge depending on the service. 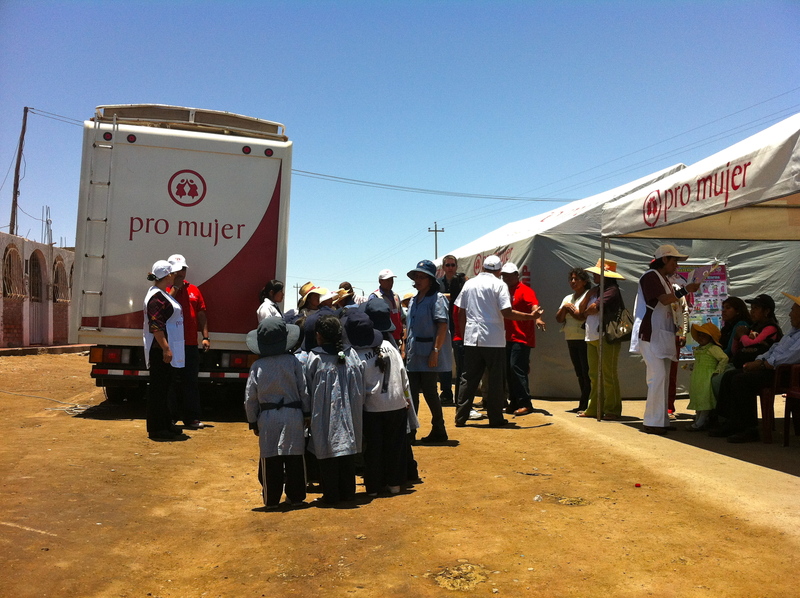 Pro Mujer in Peru has four of these mobile clinics that travel to different regions each month. Each of these campaigns lasts a few days and we don’t close shop until every last person – clients and the general public alike – gets seen by trained medical personnel. Children from the local kindergarten take a break from their school day. 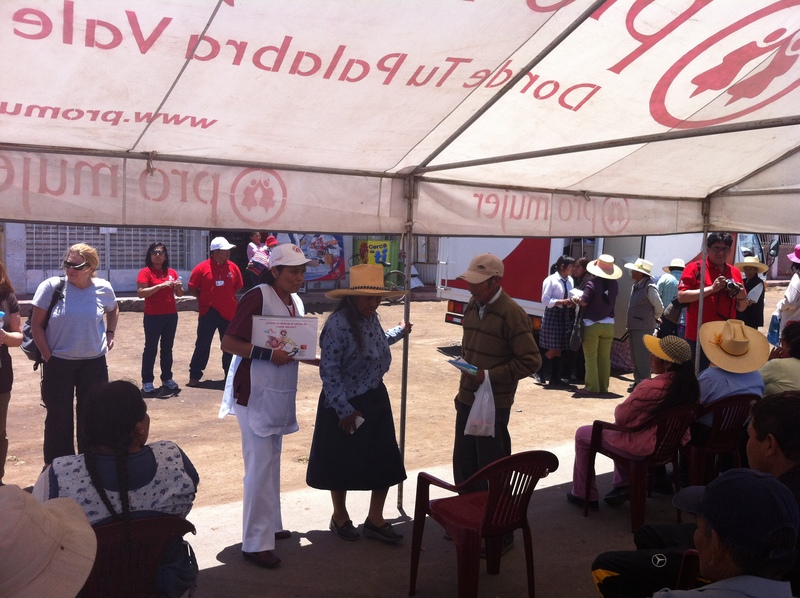 Pro Mujer staff provides patients who are waiting to be seen with preventive health education. The focus of these campaigns is the screening of chronic diseases. Other tests offered include blood pressure, BMI (body mass index) and breast exams. 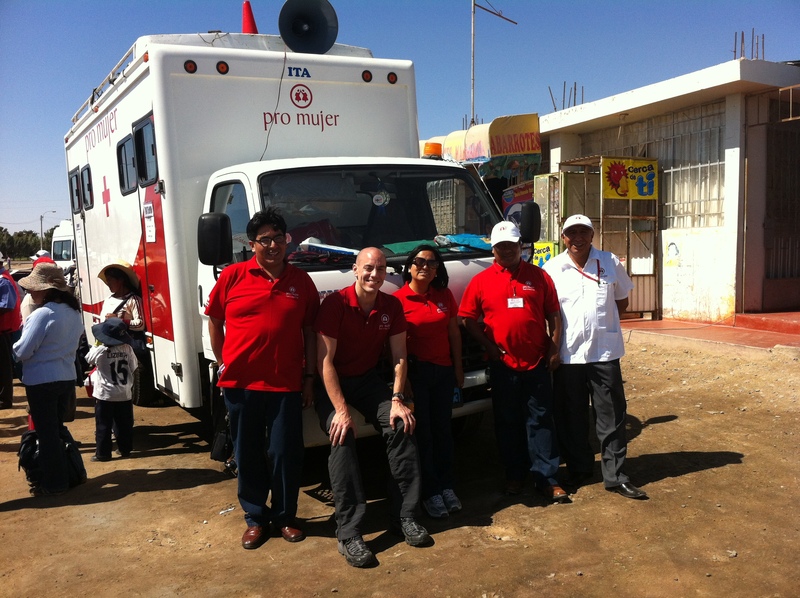 The PMP team and I – including Country Director Naldi Delgado (center) - in front of one of our mobile health clinics. For many of our clients, primary health care services are often out of reach. Frequently, the public health care system in their communities is either limited or non-existent, forcing many to travel long distances in order to access them. Once there, they join dozens if not hundreds of people also waiting to access the same services and there is no way of knowing if they will be seen by a doctor or required to come back at another time. Throughout this process, our clients are forced to grapple with the crucial decision of remaining at their place of business in order to earn much-needed income or forgo a day’s wages and spend money on transportation to a clinic when they are asymptomatic. As a result, preventivemedical attention falls by the wayside until a client is sick, and by then the situation can be debilitating both physically and financially. A few blocks from the town center where the campaign is taking place, we go to visit a Pro Mujer client at her place of business. Ángela Mamani Sulla is a 29-year old married mother of three who has a big smile and sunny disposition that makes her look years younger.Ángela runs a small convenience store which also houses the family’s living quarters. She joined Pro Mujer in February of 2010 after being invited to join the “Sacred Family” communal bank. 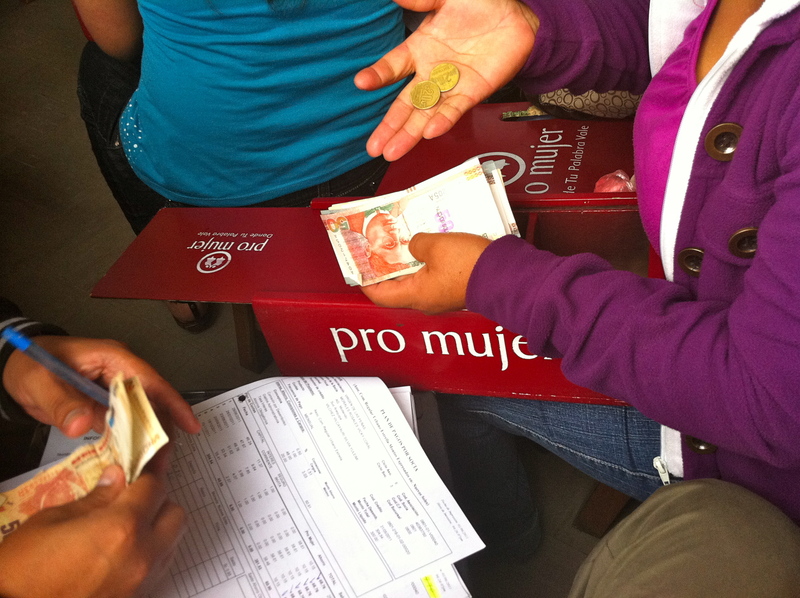 A communal bank is a group of 20-30 women who come together to take out a loan as a group and receive Pro Mujer’s services – finance (small loans, savings, insurance), business training and health care. They select a name for their group, elect a President, Secretary and Treasurer and guarantee one another’s loans as a group. In the event that one member can’t make a payment, the others make the payment for her until she is able to get back on her feet. As a result of this group guarantee, communal bank members only invite friends and neighbors who are credit- and trust-worthy. Ángela’ s first loan of US$183 allowed her to improve and expand her family’s living quarters, double the size of her business and diversify the products she sells. It is truly inspiring to hear her story and see how far she has come in a relatively short amount of time. One final picture before saying goodbye to Ángela and her daughters. As we say goodbye to Ángela and head back to Arequipa, I realize it’s been a long day of traveling and everyone is wiped out. Tomorrow we head to Mollendo, a small port town of about 30,000 people on the Pacific coast in the southwestern part of Peru. The next day we board the bus at 7 AM and over the next two and a half hours, we descend more than 6,500 feet on roads carved into the sides of mountains with spectacular, lunar-like landscapes. 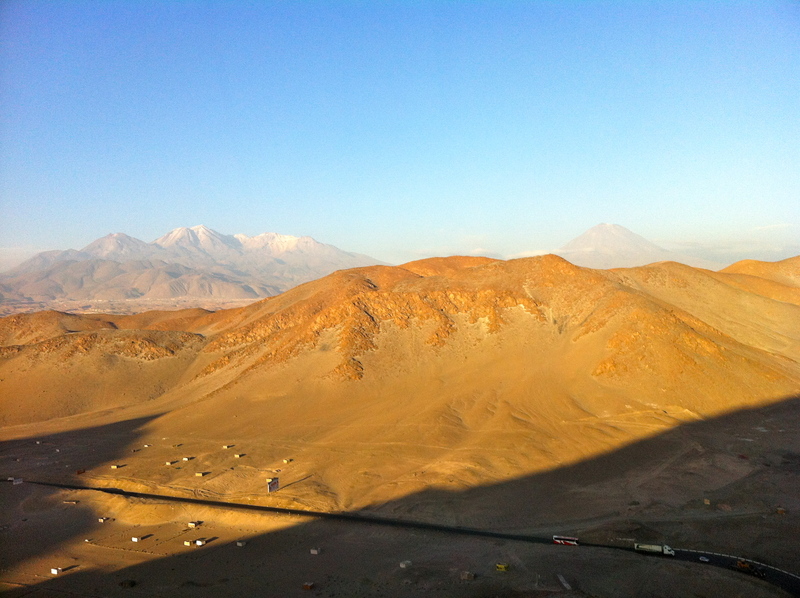 The beautiful but barren scenery on the drive from Arequipa to Mollendo. We get to our Mollendo center in time to watch the members of the San Camilo communal bank organize themselves and run their loan repayment meeting. They are a warm and welcoming group and after their meeting is over, they take time out of their day to answer some of our questions. Every time someone asks the group’s President, Secretary or Treasurer a question, they stand to respond. It’s a simple act, yet one that speaks volumes. 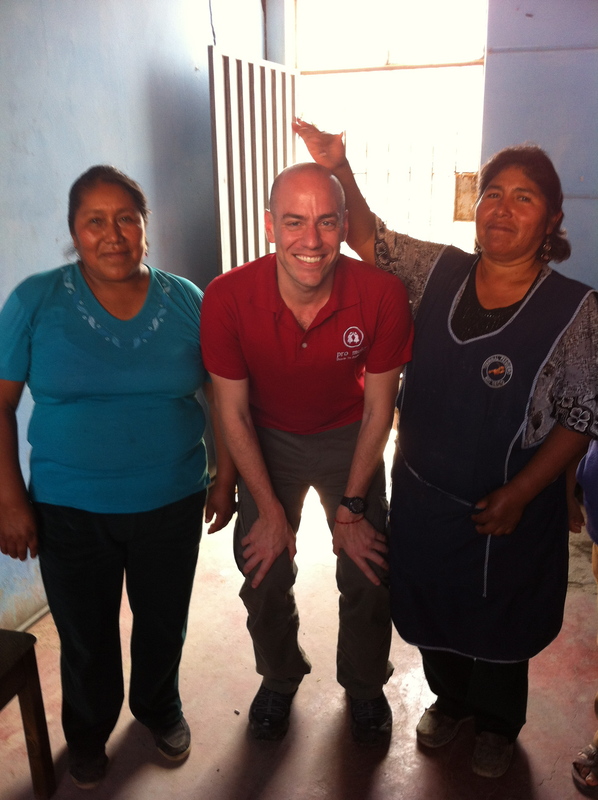 When many women first come to Pro Mujer, they are unable to speak in front of a group or even look someone in the eye. One can only imagine the circumstances that cause them to have this reaction. 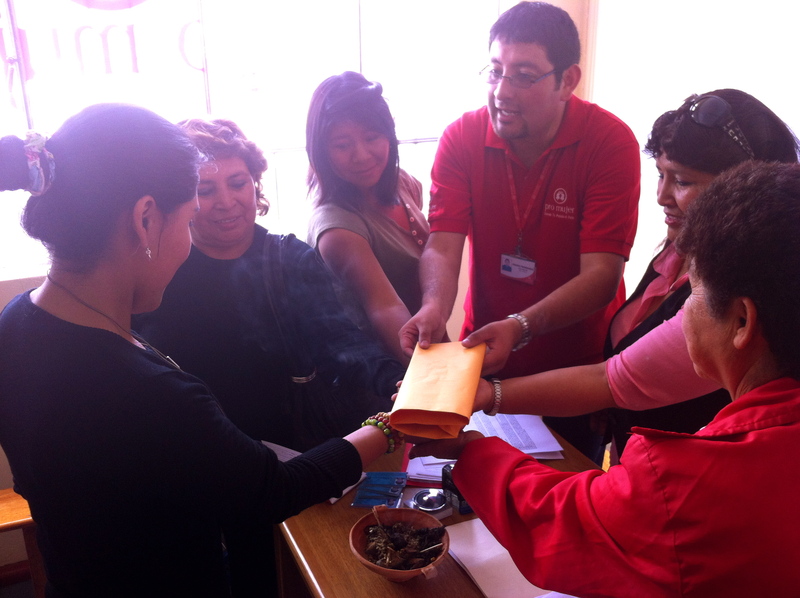 The members of the Communal Bank San Camilo process loan repayments. Within the group, we meet women (and a few men) who run businesses such as dance schools, selling AVON products (a common among our clients in a number of countries), convenience stores and restaurants, among others. By the end of our time with them, we are all laughing and joking. For however brief the exchange, they’ve allowed us into their world and I’m always touched at the close relationships we are fortunate enough to share with our clients. The reason for this is that we provide so much more than a financial transaction; Pro Mujer is a transformative experience. It is an experience of personal growth where a client realizes her rights, her self-worth and begins the process of harnessing that awakening not only for herself, but her family and community. That sense of trust, support and community, that “we’re all in this together,” doesn’t just end with our clients, it extends to our team and beyond. In a small file room, I come across a touching sight; the folder of a group of women who named their communal bank (#65) in honor of one of our Co-Founders, Lynne Patterson. It’s sandwiched between “Light and Hope” (#64) and ”Useful Hands” (#67). From Mollendo, we hop back in the van for the next stop on our journey – El Fiscal. 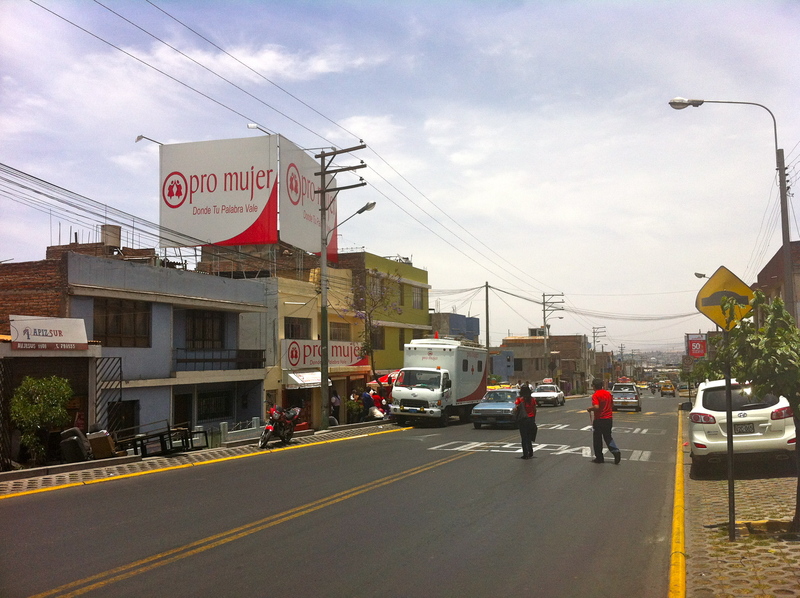 El Fiscal is a small town that has the Pan-American Highway running through the middle of it. El Fiscal caters to truckers and travelers through endless side-of-the-road businesses that offer everything from food and drinks to autoparts, among other things, for their long journeys. The communal bank group Sarita Colonia is waiting for us to arrive. They’ve finished up their meeting but remain together as a group in order to receive us. We take turns asking them questions about their lives, their businesses, and El Fiscal. 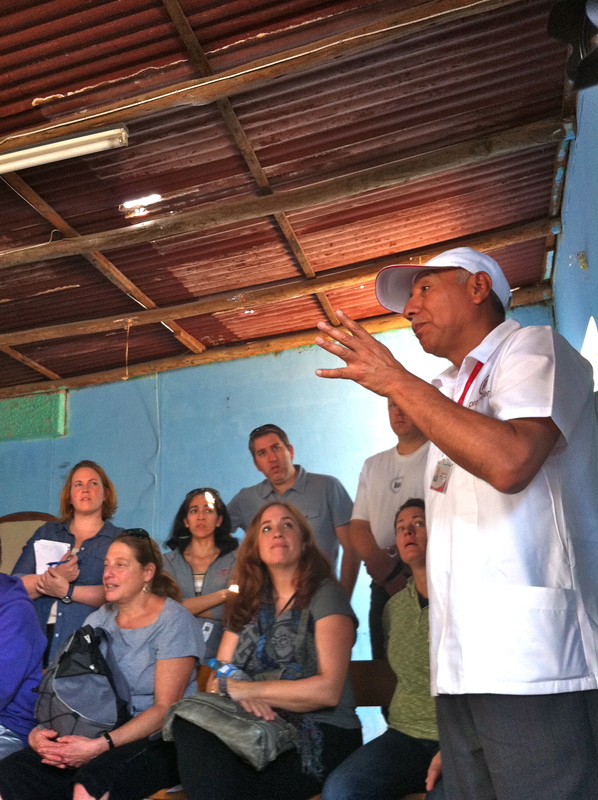 Dr. Alfonso Medina, our Health Manager for Peru, gives a talk about the importance of taking care of one’s health and making sure all of one’s exams are up to date. At the end of our session, the group brings out a traditional piqueo de camarones (a buffet if you will, of fried river shrimp complete with head, tails and everything in between) served in our honor. Camarones are the lifeblood of the women in El Fiscal. It was particularly touching that they went out of their way to host and feed us. Dr. Alfonso Medina talks about the importance of monitoring one’s health. Despite my best attempts to blend in, a client cheekily points out that I’m heads above the rest. 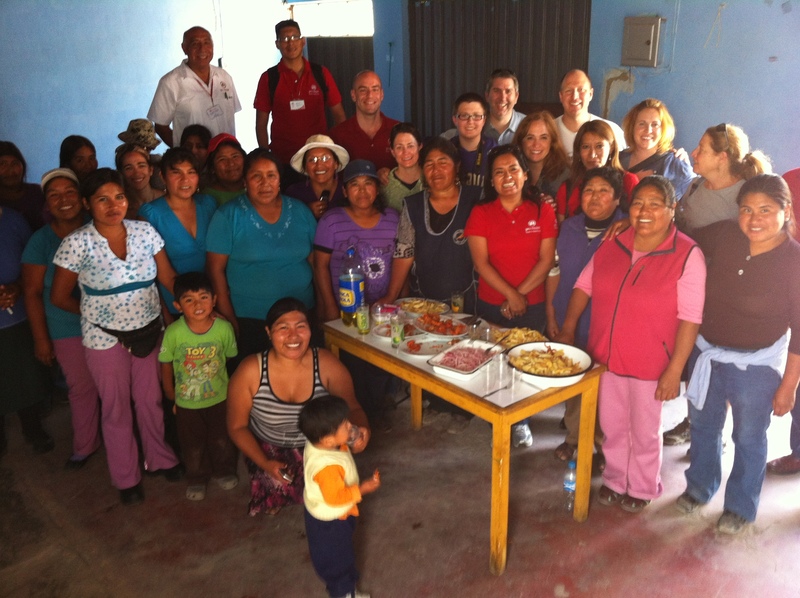 Pro Mujer staffers and visitors from Global Partnerships around the traditional Peruvian piqueo organized for us by the women of Sarita Colonia. 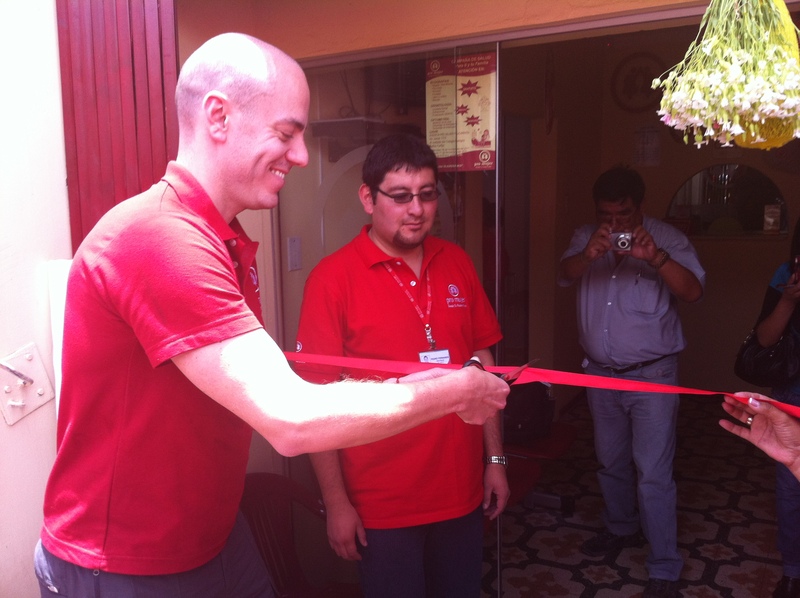 Wednesday found us celebrating the opening of one of our newest neighborhood centers, Paucarpata. In conjunction with the opening, Pro Mujer staffers held another health campaign for clients and members of the general public who had gathered for the event. Juan Carlos Torres, our Financial Services Manager, welcomed everyone with some remarks. Toasts were had and I was then given the honor of cutting the ceremonial ribbon while Naldi used a hammer to break the celebratory bottle of champagne christening the center. 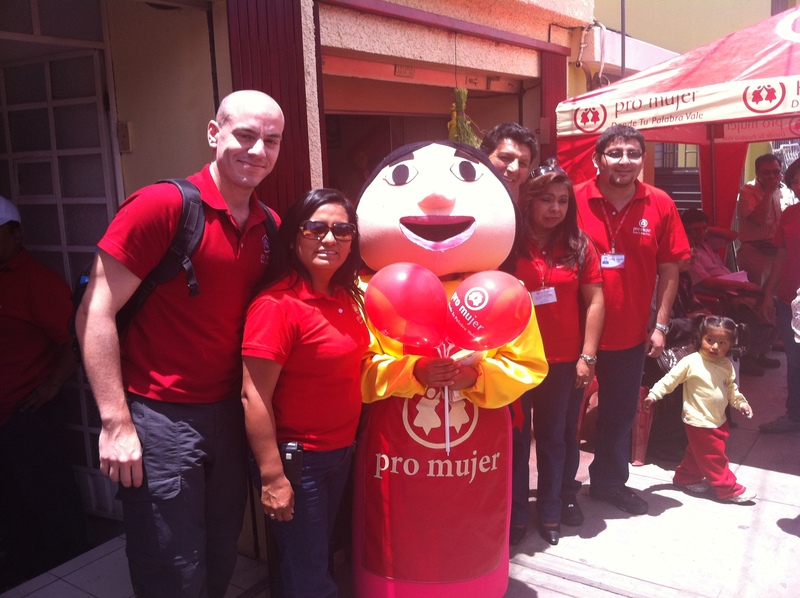 The Pro Mujer Peru team and their mascot Julia. 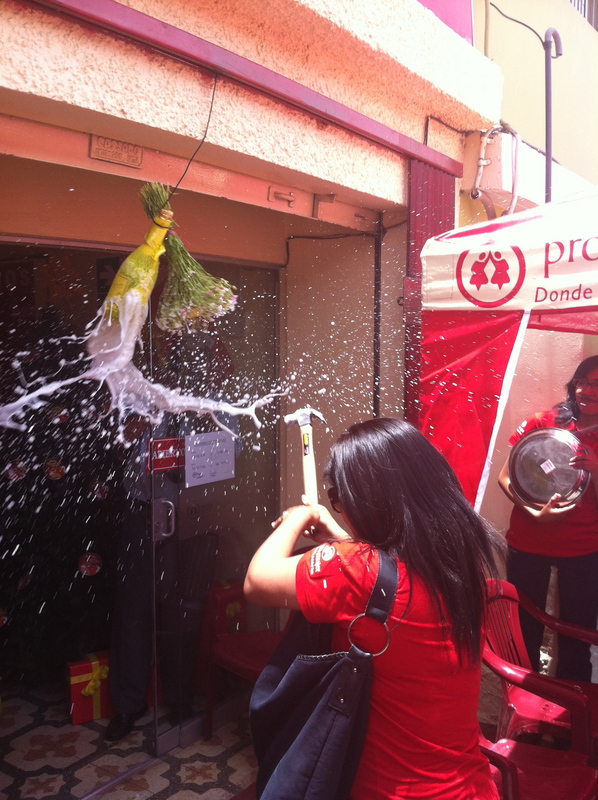 Naldi Delgado, Peru’s Country Director christens the Paucarpata center with a ceremonial whack of the champagne bottle. After the ceremony, we tour the center and learn about the services that are provided on site. There is a medical consultation room staffed by a full-time obstetrician and a unique new service for clients, a BCP (Banco de Crédito) teller machine that allows clients to withdrawal loan disbursements from their bank accounts, deposit savings and pay utility bills safely and conveniently. During the visit we have an opportunity to watch a new solidarity group (similar to a communal bank but with fewer members), receive its very first loan disbursement. The women are all very proud to be part of one of the first groups in the center, and to have us sit in on their meeting. Fernando Paca and members of the solidarity group perform a pachamama ceremony, blessing their loan disbursement in the hopes that their money will multiply and bring them success. This client thought that I would somehow bring some good luck to her funds if I handed them to her. After a few words of well-wishing, I handed them over – but I may have held onto them a few seconds more than she expected! Following the opening of the Paucarpata center, it’s time for Naldi and me to head to the airport to board another LAN flight to Lima for more meetings. 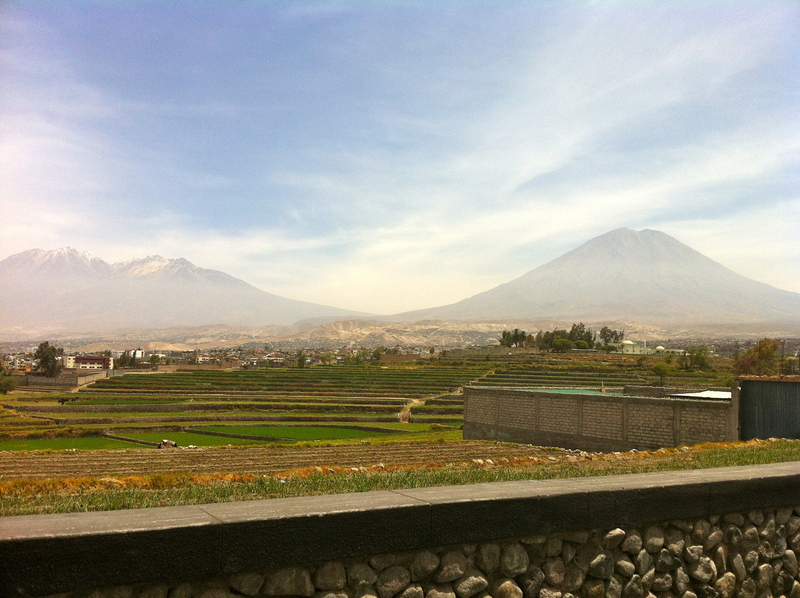 The view of Misti volcano on the outskirts of Arequipa. This morning we have a series of meetings with key people from the Universidad del Pacifico (UDP); Naldi’s alma mater and one of Peru’s top schools. A few months ago, UDP featured Naldi in a fantastic and inspirational video as part of its “Responsible Leaders” campaign highlighting outstanding alumni. Definitely worth checking out. Later on that evening, Naldi and I participate in a live, sit-down interview with Peruvian journalist Cecilia Valenzuela for her show, “Mira Quien Habla” (“Look Who’s Talking”) on Willax TV. We’re here to discuss Pro Mujer’s work in Peru and throughout the region. To watch the interview (in Spanish), please click here. 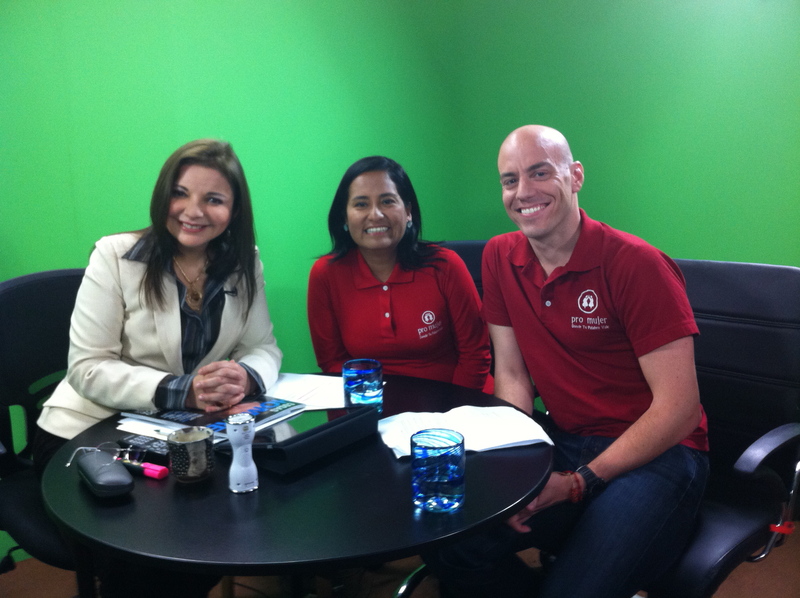 Cecilia Valenzuela, Naldi Delgado and myself after the interview. I’m up early to fly to Puno, a city on the shores of Lake Titicaca, the world’s highest commercially navigable lake at 12,421 feet above sea level. I’m warned that altitude sickness can make one very ill here, but fortunately, the only symptom I experience is insomnia…wide-awake–at-4 AM insomnia. 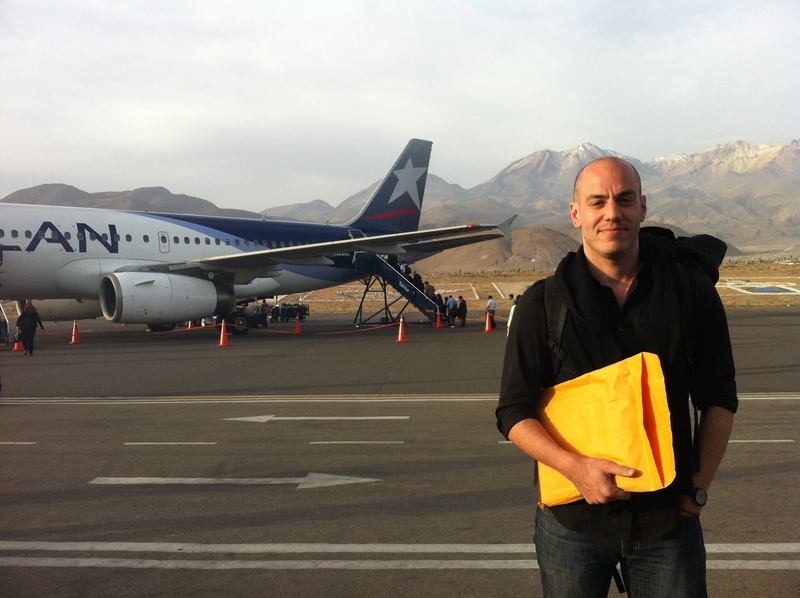 My time in Puno – and Peru – is quickly coming to a close and in less than 24 hours, I’ll begin the long journey back home. Only two weeks have passed, but the non-stop activities make me feel like I’ve been gone a lot longer – so much so that my colleagues joke that if I spent one more day, I just might be eligible for Peruvian citizenship. 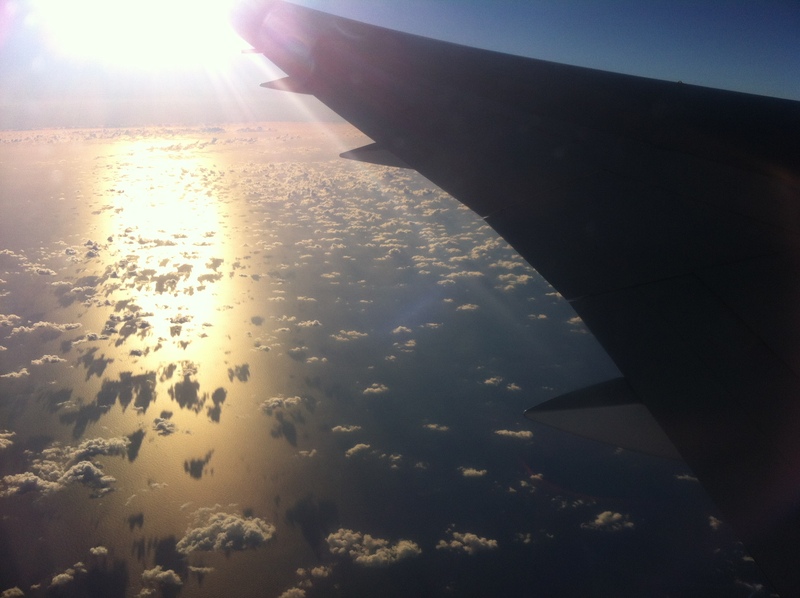 As the plane takes off and I gaze out the window over the landscape, I begin to reflect on the past few weeks. No matter which of our operations I visit, I’m always inspired by my fellow colleagues. 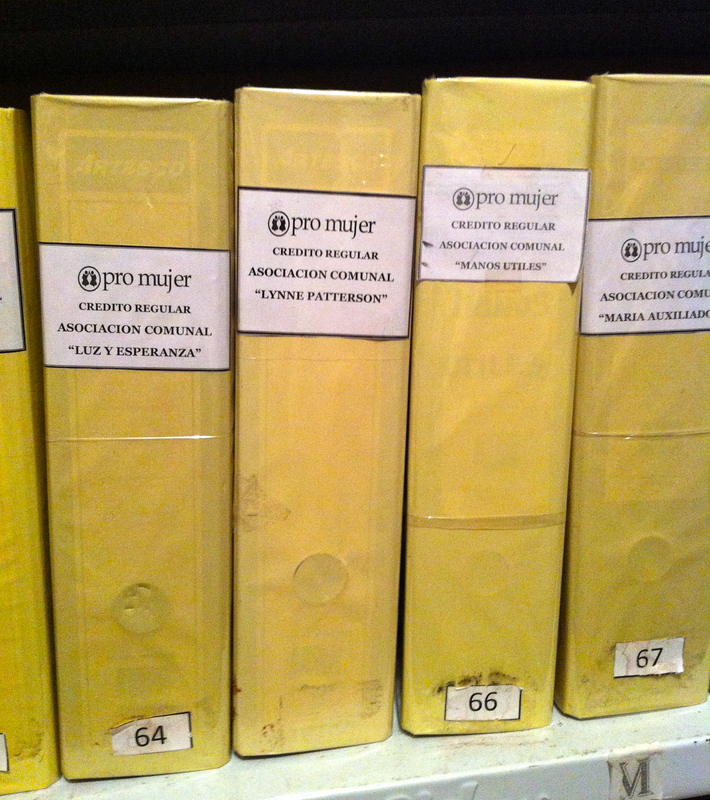 Working at Pro Mujer is a commitment to a cause. It is not a 9 to 5 job and it’s not one spent behind a desk. It is a laboratory where one is constantly overcoming challenges (earthquakes, torrential rainstorms that close airports – more on that in my next entry—blackouts, logistical issues, etc.) and trying new things to find solutions. When something doesn’t work, we recalibrate and change course on a dime. Why? Because the women we serve depend on it. Poverty is a complex issue with no silver bullet. To be a woman, to be poor and to be indigenous in Latin America is triply challenging, and serious barriers are placed in front of you from Day 1. While relative poverty varies by country, the culture of poverty among the women we serve is the same. Enduring financial struggles and discrimination, doing double duty as both a mother and a father, and wondering what curve-ball tomorrow will bring are universal. Access to health care (as a mentioned earlier) is limited or non-existent – this is a main factor perpetuating poverty, as poverty and health are inextricably linked. Because of traditional gender roles, many women are expected to take care of children and family members, often on their own because their partner is either physically or emotionally absent. These gender roles also limit their access to education and training, which then limits their opportunities for employment. They are frequently limited to jobs in the informal sector which is why so many open their own small businesses in or near their homes. Maintaining a business in the informal sector limits, or excludes altogether, access to traditional financial services. In the end, it’s a cycle that often passes from one generation to the next. Despite all the challenges they face, these women are strong, hardworking and perseverant. Women like Janeth, Luisa and countless others march forward, moving themselves and their families ahead. With the essential tools and support that we provide, I’m confident that their road will be a little easier, and that a brighter future for them and their families is just over the horizon. All photos taken with my trusty iPhone.